In July, I decided it would be fun to tally up how much we’ve saved this last year since we’ve really been putting our minds to it. I’m finally getting around to posting the results. I will share the total and details below. I did count extra payments towards loans (because it increases our net worth and I consider it part of our savings rate). I did not count regular payment towards loans. For example, a mortgage payment has a principal payment portion built into it, which technically increases our net worth as well, but I don’t count that portion because I’m lazy. I did include money that we set aside for housing maintenance/repairs (some of which has already been spent). I’m not sure of the best way to do this, but I’ll have line items so you can see what it would look like without that. 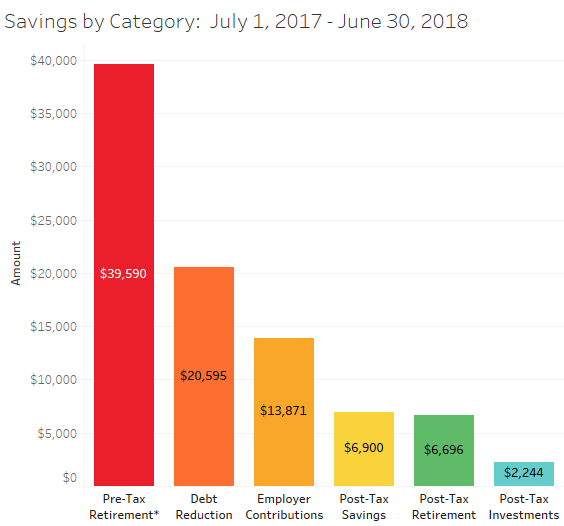 Now that we have those little details out of the way, I’m happy to announce that the grand total of our savings for the period of July 1, 2017 through June 30, 2018 was $89,896. Since I’m a data visualization nerd, I decided to create some graphs to make this more interesting. Here is a little graph to show how close we came to a 50% savings rate. I am including a tabular view at the bottom for those that prefer it. If I were to take out the last three line items which are all saved in order to be spent at some time in the (nearer-than-retirement) future, then my total would be $85,394. As you can see, over $20K went to paying down debt. This makes me so happy. I love paying down debt – it’s very freeing! Almost $40K went to pre-tax retirement accounts, which is great for lowering our taxable income*. This should turn out pretty similar next year as we plan to max out pre-tax accounts in 2018. That is something that we hadn’t intended on doing until we found out about FI in mid-2017. 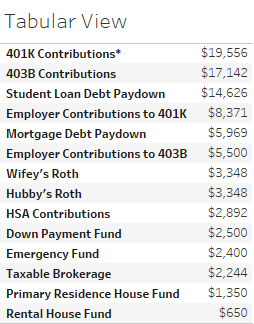 Also of note: almost $14K of free money came our way in the form of employer contributions to our pre-tax retirement accounts. That is one good reason to have a 9-5 job. *Note: I know that the 401K contributions are greater than allowable limits. The time period on this is mid-2017 to mid-2018. After discovering FI in mid-2017, we increased contributions to make up for some of what we did not contribute during the earlier part of the year. Thus, our contributions are lopsided at the end of 2017.